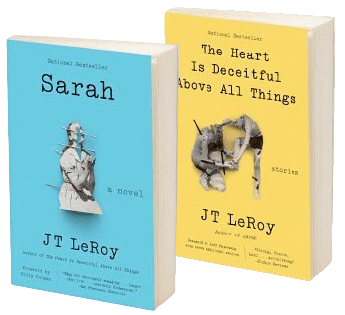 We want to notify all our friends of Laura Albert’s UPCOMING APPEARANCE: On Friday October 7 at 7 PM the fine people at Books Inc. in Berkeley, CA (1491 Shattuck Avenue, 510-525-7777) are doing an event with her to celebrate the reissue of the JT LeRoy books Sarah and The Heart Is Deceitful Above All Things by HarperCollins. Justin Desmangles will be speaking with Laura about her writing, and Laura will be signing books and meeting with readers. Read more about this event here. Please join us if you can, it’ll be fun! Further appearances planned for October in Brooklyn and Los Angeles — watch our website for the latest news! Laura’s reading at Booksmith in San Francisco, held on September 7 and hosted by Grant Faulkner, was a big hit! Filmmaker Jeff Feuerzeig, the auteur of Author, made a surprised everyone by making an unexpected appearance — he insisted there was no way he’d miss the first reading held in the US for Laura under her own name! Laura persuaded him to share a few words with the audience, which was much appreciated by all. The Booksmith event was standing-room-only, and the books flew off the shelves. Don’t take our word for it — here’s the tweet! A special message from Laura just before the San Francisco opening of AUTHOR	Appearances in Toronto and Brooklyn and Sweden!